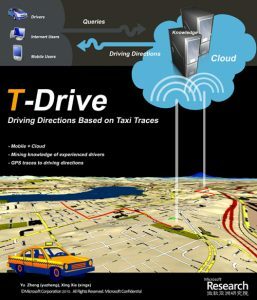 T-drive is a smart driving direction services based on GPS trajectories of a large number of taxis. It helps user find out the practically fastest path to a destination at a given departure time. A prototype has been built based on a real-world trajectory dataset generated by 30,000 taxis in Beijing in a period of 3 monthes. The service is available (within Microsoft corpnet), which provides a user with the practically fastest path with less online computation and according to your departure time. First, taxi drivers are experienced drivers who can usually find out the fastest path to send passengers to a destination based on their knowledge. Second, the GPS-equipped taxis are mobile sensors probing the traffic flows on road surfaces. So, the taxi trajectories contain the information of both human knowledge of experienced drivers and traffic patterns. Refer to our T-Drive publication on ACM SIGSPATIAL GIS 2010, which won the best paper runner up award and was featured on the homepage MIT Technology review. We evaluate the system with extensive experiments and in-the-field evaluations. The results show that our method signi cantly outperforms both the speed-constraint-based and the real-time-traffic-based method in the aspects of e ectiveness and efficiency. Given over 5 taxis in a region of 1km2, more than 60% of our routes are faster than that of the speed-constraint-based approach, and 50% of these routes are at least 20% faster than the latter. On average, our method can save about 16% of time for a trip, i.e., 5 minutes per 30-minutes driving. “A driving route made just for you“, MIT Technology Review, 2011.8.30. (Another Chinese version). Cabbies help Microsoft Improve Online Mapping, Wired, November 10, 2010.